New Rochelle, NY, July 2, 2018–Groundbreaking research demonstrates proof-of-concept for using CRISPR-Cas9 genome editing technology to correct the gene mutation responsible for alpha-1 antitrypsin (AAT) deficiency, successfully making a targeted gene correction in the livers of affected mice that restored at least low levels of normal AAT. In the studies, both published in Human Gene Therapy, a peer-reviewed journal from Mary Ann Liebert, Inc., publishers, two groups of researchers used somewhat different approaches to achieve these historic results in mouse models of AAT deficiency (AATD) and discuss why their findings are so important for the future treatment of patients with ATTD, The articles are available free for download on the Human Gene Therapy website until August 2, 2018. The article entitled "In vivo Genome Editing Partially Restores Alpha1-Antitrypsin in a Murine Model of AAT Deficiency " was coauthored by Terence Flotte, Editor-in-Chief of Human Gene Therapy, and Wen Xue, both from the University of Massachusetts Medical School (Worcester), together with a team of researchers from UMass Medical School, Tongji University (Shanghai, China), and Wuhan University (China). The re-searchers co-injected two adeno-associated viral (AAV) vectors: one to deliver the Cas9 component of the CRISPR-Cas9 system; and the second encoding an AAT gene-targeted guide RNA and carrying a homology-dependent repair template. Shen Shen, Editas Medicine, together with researchers from Editas and St. Louis Uni-versity School of Medicine (MO) coauthored the article "Amelioration of Alpha-1 An-titrypsin Deficiency Diseases with Genome Editing in Transgenic Mice." They demon-strated both a gene knockdown approach, in which they reduced the expression of the toxic mutated AAT in liver cells by more than 98%, and the use of a dual-vector system capable of achieving a 4-5% nucleotide correction at the site of the target mutation. "Those two back-to-back papers published in Human Gene Therapy represent an im-portant milestone in AATD gene therapy, demonstrating for the first time that in vivo ge-nome editing by rAAV-mediated delivery of CRISPR-Cas9 holds the potential for a novel therapeutic modality to treat AATD," says Human Gene Therapy Editor Guang-ping Gao, PhD, Gene Therapy Center & Department of Microbiology and Physiological Systems, University of Massachusetts Medical School. Research reported in this publication was supported by the National Institutes of Health under Award Number DP2HL137167, P01HL131471 R01DK098252, R24OD018259, T32GM107000. The content is solely the responsibility of the authors and does not neces-sarily represent the official views of the National Institutes of Health. Human Gene Therapy , the Official Journal of the European Society of Gene and Cell Therapy, British Society for Gene and Cell Therapy, French Society of Cell and Gene Therapy, German Society of Gene Therapy, and five other gene therapy societies, is an authoritative peer-reviewed journal published monthly in print and online. Led by Editor-in-Chief Terence R. Flotte, MD, Celia and Isaac Haidak Professor of Medical Education and Dean, Provost, and Executive Deputy Chancellor, University of Massachusetts Medical School, Human Gene Therapy presents reports on the transfer and expression of genes in mammals, including humans. Related topics include improvements in vector development, delivery systems, and animal models, particularly in the areas of cancer, heart disease, viral disease, genetic disease, and neurological disease, as well as ethical, legal, and regulatory issues related to the gene transfer in humans. Its companion journals, Human Gene Therapy Methods, published bimonthly, focuses on the application of gene therapy to product testing and development, and Human Gene Therapy Clinical Development, published quarterly, features data relevant to the regulatory review and commercial development of cell and gene therapy products. 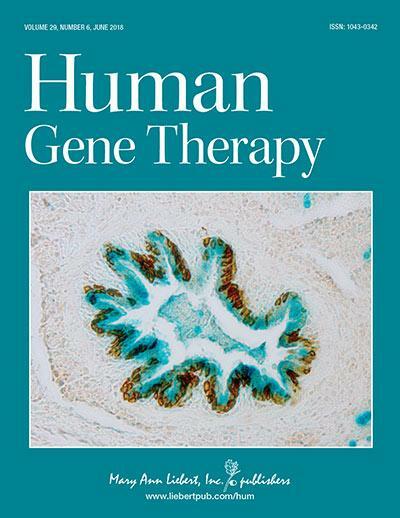 Tables of contents for all three publications and a free sample issue may be viewed on the Human Gene Therapy website.